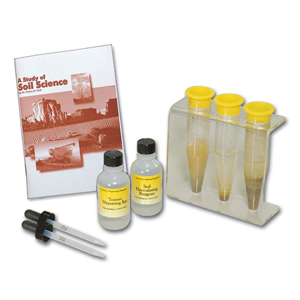 In addition to the combination outfits for agricultural and turf soils, a selection of single parameter test kits is available for soil nutrients that may be of particular interest or a problem to the grower. All OMEGA™ soil test kits measure the portion of soil nutrients available for the plant to use. Since extraction not complete, the amount that is measured is relative and is dependent on the extraction procedure. Pounds per acre represents the number of pounds of soil in an acre down to the depth of 6-7 inches, and is = 2,000,000 lb. The overall texture of a soil affects growth in the root zone, which determines above-ground growth, and is determined by the proportions of sand, silt, and clay present.